What are values and how do we define them? Are there specific Islamic values? Do universal core values exist? How do we pass on appropriate values to future generations? This issue of Critical Muslim tackles these questions, with contributions from Rowan Williams, Kabir Helminski, Jeremy Henzell-Thomas, Charles Butterworth, Boyd Tonkin, Alex Moore, Mohammed Hashas and others. About the Author: Ziauddin Sardar is an award-winning, internationally renowned writer, futurist and cultural critic. A former columnist on the New Statesman, he has also served as a Commissioner on the Equality and Human Rights Commission. He is the author of many books, including Desperately Seeking Paradise: Journeys of a Sceptical Muslim (Granta); Reading the Qur'an (Hurst); and Mecca: The Sacred City (Bloomsbury). He is editor of the influential quarterly, Critical Muslim. 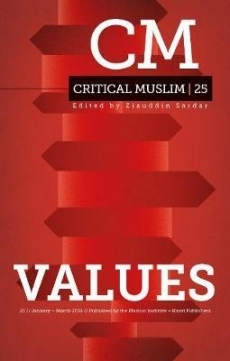 Be one of the first to review the Values: Critical Muslim 25.